Hello, new year, which snuck up on me the same way Thanksgiving, Hanukkah and Christmas did. 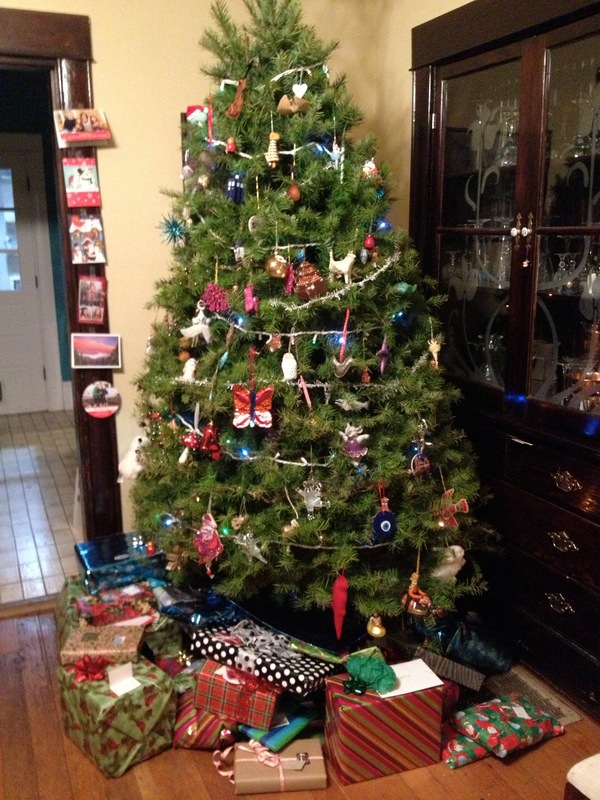 “it kind of feels like the holidays didn’t happen this year,” remarked Daughter #1. I know what she means. All our little rituals —the advent calendar (which admittedly, I’ve never managed to have together by December 1), lighting the menorah (which admittedly, we’ve never managed to remember to light all eight nights. 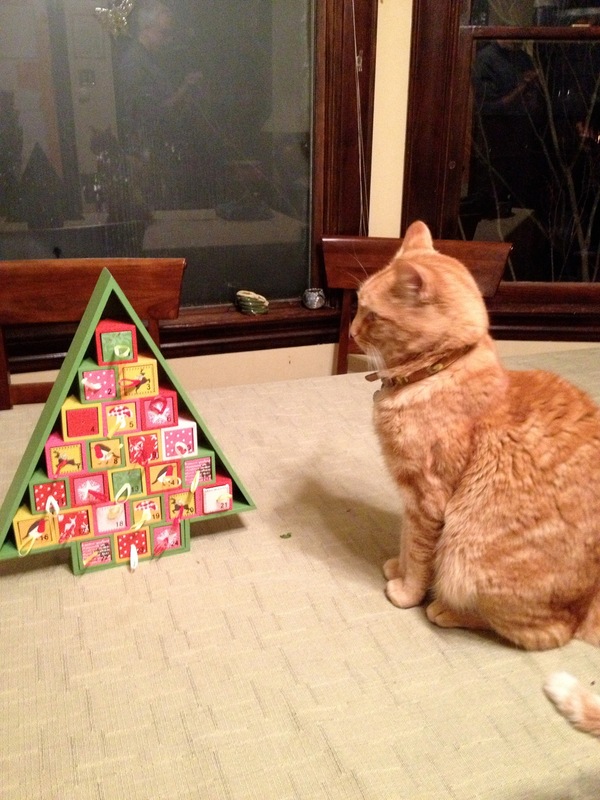 This year, because of Thanksgivukkah, we hit an all-time low), creating a photo calendar and trimming our Christmas tree were done haphazardly, late and without the enthusiasm of years past. Finding a time when everyone was available to go get a tree was tough. Finding the time for our family ritual of eating gingerbread and going through our ornaments one by one, sharing the associated memories, was challenging. For us, that luxurious block of time known as winter break was taken up by a week’s worth of flu. When we weren’t sleeping or sneezing or writing cards or working we were dragging ourselves around town shopping for presents, baking cookies (even during the “barfing Christmases” of yore, I always baked cookies) and trying to get into the Christmas spirit. We’d come home and take to our beds or the nearest couch to recover from the exertion. Each year, we buy a few new ornaments to commemorate the year’s highlights. It’s sweet and increasingly bittersweet to look at the ballerinas and Disney princess ornaments, the owls, mushrooms and pet-related trinkets (the most heartbreaking is the ornament to commemorate our departed hamster Zen, the only rodent I have ever loved). 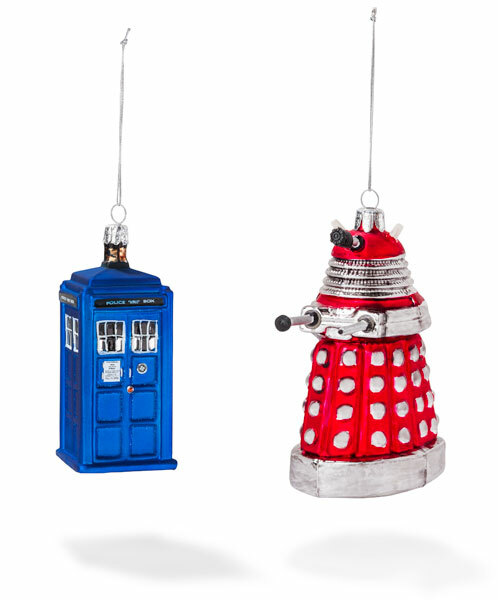 This year, Daughter #1 got a Tardis ornament. 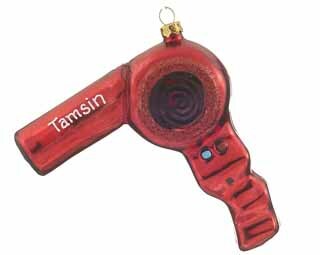 Daughter #2 got a hairdryer ornament. And I got an ornament of Seville. Because Spain is what will get me out of the doldrums and jumpstart my year. We are going to Spain, Andalusia to be exact, later this year. We’ll stop in London for a few days for the benefit of Sherlock and Dr. Who-obsessed Daughter #1. 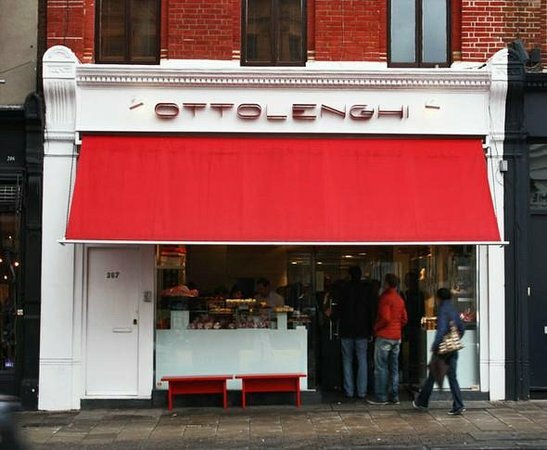 While there, we’ll eat in one of Yotam Ottolenghi’s restaurants. For me, this is the adult equivalent of going to a One Direction concert. I am giddy. Everyone in the family had a different vacation wish list and London/Andalusia fits the bill. Daughter #2 wanted to go somewhere warm. Jeff wanted to windsurf. And I, who am fascinated by Muslim culture, am interested in seeing Moorish Spain. And am looking forward to taking a day trip to Tangiers. On New Year’s Eve, we started feeling better and arranged to have a small tapas and paella party at home. I started sipping Fino sherry at around 6:00. We indulged in an array tapas, including gambas al ajillo, mejillones a la marinera and queso manchego con membrillo.These recipes came from Tapas, the little dishes of Spain, by the late Penelope Casas, a book I scored one year at our biannual library sale (sadly, a scavenger hunt tradition I have let fall by the wayside). We supped on my friend Diane’s paella and her brother-in-law Ian’s sugar plums (not authentically Spanish, but oh, so good). At midnight I had a few sips of Cava leftover from last January’s book launch party, and tried to get over the fact that, thanks to the developer who bought the property across the street and is now building a monstrosity, we no longer have a New Year’s Eve view of the fireworks over the Space Needle or our clear-day treat of a glimpse of Mount Rainier. The new year arrived and with it, woes. These days, at any given moment, I am worried about people who are close to me, sometimes everybody all at once, and even the dog. I appeared on TV and learned the life lesson that wearing polka dots on TV is a bad idea. So I decided to think about Spain. I read this article about a jamon master. I sought out recipes featuring jamon serrano and jamon iberico, arranged to buy replacement parts for my Spanish-manufactured Fagor pressure cooker and anticipated the Spanish pressure cooker recipes I could experiment with. Daughter #1 and I watched Vicky Cristina Barcelona. My friend P, who was widowed when both she and her kids were young, was waxing poetic on Facebook about holiday traditions, remembering the Christmas Eve screenings of It’s a Wonderful Life and staying up late stuffing stockings after the preschoolers had gone to bed, anticipating the early morning Christmas magic to come. These days, my girls like to sleep in, so I was the only one up early on Christmas. The good news is magic is magic at 6 a.m. or at 10 a.m. And as long as there’s coffee, either is fine. In a post entitled “Time to Enjoy the Gifts That Matter,” Catherine Buday, who blogs as The Sandwich Lady, describes letting go of traditions —no writing Christmas cards or baking multiple batches of cookies— instead, simply enjoying the return of the prodigal kids and having the whole family together on one couch. One of my all-time favorite cookbooks is Anya von Bremzen’s The New Spanish Table. Every recipe in the book is outstanding. One of my favorites is Garlicky Braised Green Beans with Jamon. You know how I feel about Yotam Ottolenghi. This recipe for Saffron Cauliflower is a winner. Time will pass and people will change. But one tradition I will never give up is exploring the world from my kitchen. This entry was posted in Cooking, Family, Food, Friends, Holidays, Teenagers and Adolescence and tagged Anya von Bremzen, jamon, New Year's Eve, paella, Penelope Casas, Spain, Spanish cooking, tapas, Yotam Ottolenghi by Slice of Mid-Life. Bookmark the permalink.